Here is a list of the TECHnalysis Research president and chief analyst Bob O'Donnell media mentions from 2014. • What are the big tech trends in 2015? • Is Samsung being pressured by shareholders? • Preview of Facebook earnings: Should you expect a surprise? • Apple’s iPad Unveil: Were There Any Surprises? 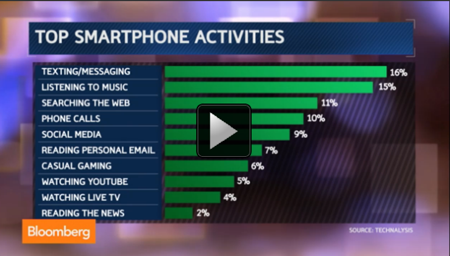 • What Are People Doing on Their Smartphones? • Is Samsung Scaring Apple Investors? • Should Samsung Fear the Next iPhone? • Is Samsung facing a double whammy? • What's Facebook's goal behind Paypayl hire? • HBO's Amazon Deal: How Bad for Netflix? • Comcast-TW Cable Deal: How Do Cord-Cutters Fit In? • 2015: The year of ‘retro-tech’? • Will Windows 10 prompt a surge of PC upgrades in 2015? • IBM Fundamental And Algorithmic Analysis: Will Big Blue Bring Big-Time Blues? • Who is Dion Weisler? • Can Hewlett-Packard survive the tablet trend? • Should you buy an HP printer or PC after the plan to split? • Will Apple iPhone 6 Plus help doom 7-inch tablets? • Has Apple Reclaimed It’s Technology Innovation Crown? • Praise for the Apple Watch - but it's the iPhones that will bring in the big money! • Did Samsung Spook Apple Investors? • Is the Curtain Falling on Tablets? • PCs are Back! Well, Sort Of. • PCs stabilize, tablets are slowing down. What gives? • Are the best days behind world's no.1 smartphone maker? • What Do Android L and iOS 8 Mean for Business? • Are Kazuo Hirai's days as Sony CEO numbered? • Goodbye Nokia, Hello Microsoft Mobile? • Will tablets with the Windows 8.1 update come to an office near you? • Will Sony's Amputation Plans Staunch the Bleeding? • Are dual-OS Windroid devices coming to an enterprise near you?